John Fidler was a hard and dedicated second row who made 281 appearances for Gloucester and won four England caps. He played throughout Gloucester’s victorious 1978 cup campaign. toured Romania with England B in 1978 and toured Argentina in 1981 and South Africa in 1984 with England. He played for Gloucestershire in five championship-winning sides (1974-75-76-83-84) and in a remarkable nine finals in all. He also played for the Barbarians and toured South Africa with Gloucestershire and the British Police. John Howard Fidler was born in Cheltenham on 16 September 1948. As a schoolboy, he was an automatic choice for Gloucestershire Schools and won four caps for England Boys Clubs. Like Phil Blakeway and Peter Buxton, he was a product of Cheltenham Colts. 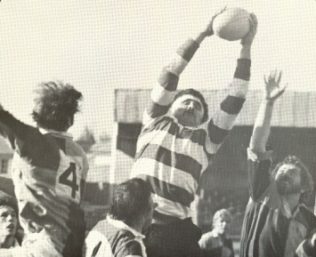 He joined Gloucester RFC from Cheltenham in 1972 and made his debut against Broughton Park at Kingsholm in the first match of the 1972-73 season. He had already played at Kingsholm for Cheltenham against Gloucester in 1970 and 71. It was a fine first season and resulted in selection for Gloucestershire in the County Championship quarter final. He kept his place and went on to play against Lancashire at Bristol in the first of his nine Championship Finals. Further recognition came in October 1973 when he played for South and South West in a 15-14 victory over the Australian tourists at Bath and in March he was on the winning side for the first time in a County Championship Final, dominating the lineout when Gloucestershire beat Lancashire 22-12 at Blundellsands. Another fine season followed in 1974-75. Fidler played in the England area trials and was rated by The Times to have a great opportunity to go further. He dominated the lineout in the semi-final and final of the County Championship as Gloucestershire comprehensively outplayed Warwickshire and then beat East Midlands at Kingsholm to retain the title. Continuing to press his claim for an England place in 1975-76, he played for Western Counties against the Australians in November and the following month for the South West Division against England in the second of the area trials. He was not selected for the final trial, to the disappointment of The Times correspondent, but was again on the winning side in the County Championship Final against Middlesex at Richmond in March. In September 1978 John Fidler injured his knee in training and went into hospital for an exploratory operation . Returning against Newport at Rodney Parade in October, in what was to be his only game of the season, he injured his knee a second time. He contemplated retirement, but was back the following season to reclaim his county place and play against Lancashire in the 1980 Final. Slowed a little, but otherwise playing as well as ever, he represented the South West Division and reached the 1981 County Championship Final yet again with Gloucestershire (this time against Northumberland). This finally got him the recognition he deserved and he was chosen for the 1981 summer tour of Argentina. He played in both tests. In 1983 at the age of 34 and now playing regularly for Gloucester United, he was recalled by the county for the Final against Yorkshire, when John Orwin was suspended. The following season he was back playing regularly for the 1st XV. He was chosen for The Rest against England and played for Gloucestershire in the first County Championship Final to be held at Twickenham – a magnificent 36-18 win over Somerset. He toured South Wales with the Barbarians that Easter. Now approaching 36, he was chosen to play in both tests on England’s summer tour of South Africa. He announced his retirement after the tour. After retirement as a player, he served first as Gloucester team secretary and then as team manager during the transition to the professional game. He is the father of Gloucester, Bath and England lock Rob Fidler.